The name refers to a five-row art deco pearl necklace with a diamond mounted platinum clasp, given as a birthday gift by Her Majesty Queen Mary, to her granddaughter, Her Royal Highness, The Princess Margaret on the occasion of her 18th birthday in 1948. The princess who was particularly fond of this pearl necklace, wore them on many occasions after 1948, and was pictured wearing them in many famous portraits, including her sittings for Baron and Cecil Beaton for her 19th, 20th and 21st birthdays. The necklace was Lot No. 118 at Christie's sale 7335 held in London on June 13, 2006, featuring Jewelry, Faberge, furniture and works of art from the collection of H.R.H. The Princess Margaret, Countess of Snowdon. The art deco pearl and diamond necklace is 39 cm (15 inches) long, and under the modern system of classifying pearl necklaces based on their length, the necklace falls under the category of a "Choker" whose length ranges from 14" to 16" (inches). The "Choker" is the most popular category of necklace, suitable for both formal and casual occasions. The necklace consists of five graduated rows of pearls, with the larger pearls in each row situated in the front and gradually decreasing in size on either side towards the rear. The number and arrangement of pearls in each row from the outer (first) to the inner row (fifth), successively are given below, in which No. 1 represents the median pearl, and the numbers on either side, the number of pearls on either side of the median pearl. The median pearls are the largest pearls in each row, and lie below one another along the median line of the necklace, that divides it into two equal halves. Its interesting to note that the number of pearls in each row is always an odd number, which provides for the arrangement of a median pearl in the center, and an equal number of pearls on either side. 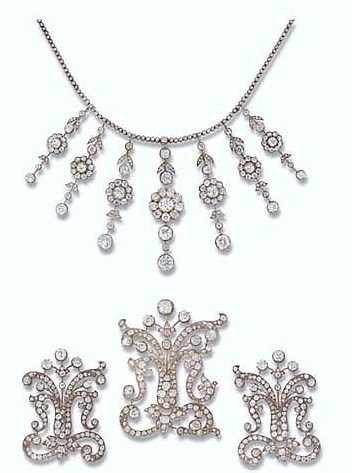 Each of the rows in the necklace are attached separately to the platinum clasp behind, mounted with vari-cut diamonds. Thus, the necklace has a total of 319 pearls. Size of pearls are given both in terms of dimensions and weight. Dimensions are usually measured in millimeters, and the weight is given in grains or carats. Unfortunately, the size of the pearls in the necklace, whether in terms of dimensions or weight are not given in the catalogue published by Christie's, providing sale information of the jewels belonging to the collection of H.R.H. The Princess Margaret, that was put up for auction on June 13, 2006, at King Street in London. However, by studying the photograph of the necklace, the approximate range of size of the pearls in the necklace could be predicted; which appears to be within the range of 2 mm to 8 mm. Pearls that are less than 2 mm in size are referred to as seed pearls, and none of the pearls in this necklace fall under this category. Yet, the pearls are quite small, and appear to fall within the above range; the range of size of pearls produced by the oyster species, Pinctada radiata. The shape of the pearls in the necklace are also not given, but a careful examination of the photograph shows that most of the pearls in the necklace are spherical or near-spherical pearls, with a few button-shaped pearls towards the rear of the necklace. The color of the pearls in the necklace are not stated, but all the pearls in the necklace appear to have the same hue and tone of colors, pointing to their common origin. The color appears to be silvery-white, where white is the main body color of the pearls, caused by the absence of colored pigments, usually associated with the conchiolin part of the nacre, allowing the white color of aragonite (crystalline calcium carbonate) to show through. The silver color is actually an overtone color caused by the refraction of light as it passes through successive layers of nacre. The luster of the pearls, caused by the reflection of light from the surface of the pearl and just below the surface of the pearl, are in keeping with their saltwater origins. The color, overtones, orient and luster of the pearl are properties dependant on the thickness of nacre in the pearl. Natural pearls are made entirely of nacre, and thus these properties are shown at an optimum level in such pearls. The Princess Margaret's Five-Row Art Deco Pearl and Diamond Necklace that was Lot No. 118, at the Christie's historic sale of the renowned collection, that once belonged to H.R.H. The Princess Margaret, Countess of Snowdon, held on June 13, 2006, was accompanied by report No. 979893, dated March 3, 2006, issued by the Precious Stone Laboratory, London, certifying that the pearls in the necklace are natural. The necklace was also accompanied by a fitting green leather case, produced by Asprey & Co. Ltd., New Bond Street, London, and the lid of the case was embossed with H.R.H. The Princess Margaret's "M" monogram, beneath a coronet. The necklace was designed approximately in the year 1925, for Queen Mary, the wife of King George V, and the Queen Consort of the United Kingdom, whose reign extended from 1910 to 1936. 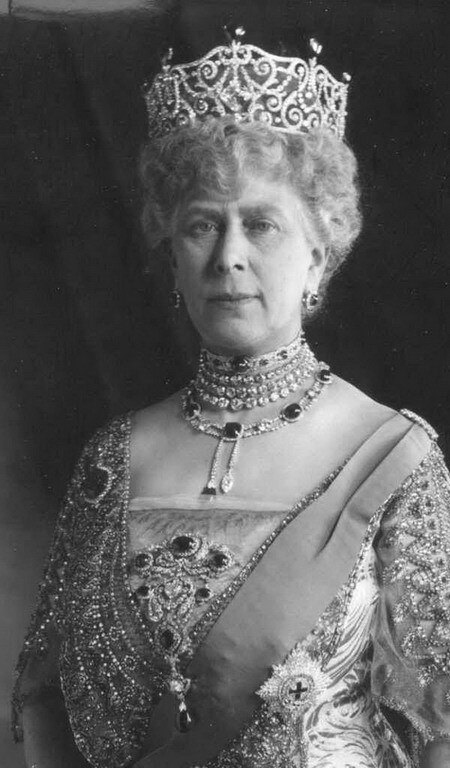 Queen Mary became famous for superbly bejeweling herself for formal events, and projecting the image of the queen as a stately, heavily bejeweled and dignified figure. She developed a passion for collecting objects of art, jewels and jewelry. 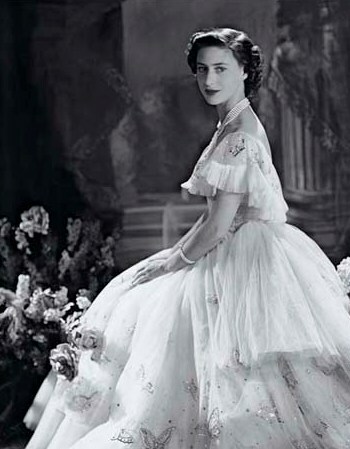 Besides this she also collected other items that was previously owned by the royalty, such as porcelain, cameos, royal seals, Faberge animals, jeweled fans and gold boxes encrusted with jewels. She is credited with reorganizing the royal collections, and the furniture in the royal residencies, and re-assembling portraits, plates, pieces of furniture, miniatures and relics, which had previously been dispersed, and which she now re-integrated into the collections at Windsor Castle. She acquired the Romanov jewels that belonged to Russia's Dowager Empress Marie Feodorovna, sister of England's Queen Alexandra, who escaped the Russian Revolution, from the Empress' two daughters, after her death. She also mounted the various Cullinan satellite diamonds in a variety of settings, some with dual use, as part of her crown or dismantled to form a brooch. She also got the crown jewelers to design and execute the famous Cambridge and Delhi Dunbar Parure, in anticipation of the coronation of King George V and herself as Queen, on June 22, 1911, and their subsequent proclamation as Emperor and Empress of India, at a special Durbar that was held in Delhi on December 12, 1911. Queen Mary, heavily bedecked with jewelry was also hailed, as the most spectacular royal guest, who attended the wedding of Kaiser Wilhelm's daughter in 1913. The Princess Margaret five-row, art deco, pearl and diamond necklace was also a piece commissioned by Queen Mary around 1925, during her period of reign, and entered her personal collection of jewelry, like the Cambridge and Delhi Dunbar Parure. King George V died in 1936, and was succeeded by his eldest son Edward, who ascended the throne as Edward VIII, but to Queen Mary's utter dismay he abdicated the same year to marry twice-divorced American socialite Mrs. Wallis Simpson. Edward VIII was succeeded by his shy and stammering younger brother Albert, who ascended the throne as George VI. Queen Mary provided great support to her timid, stammering son, in the early years of his reign, a support that continued until the King's death in February 1952. 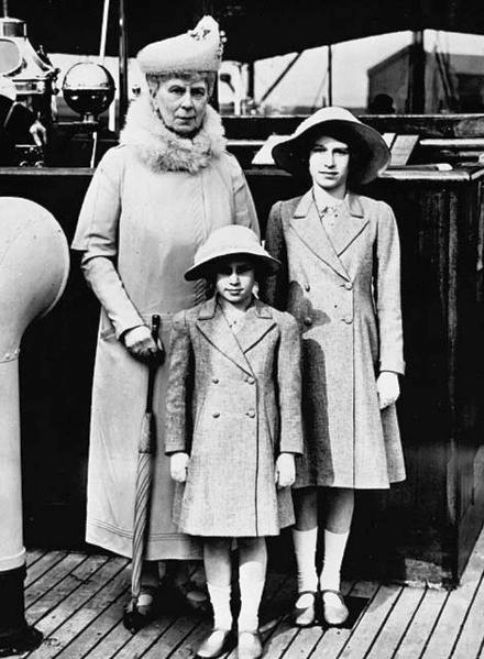 Queen Mary became very close to her two granddaughters, Elizabeth and Margaret, the children of King George V and Queen Elizabeth Bowes-Lyon, and took a keen interest in their upbringing. She took the children on excursions in London, to art galleries and museums. During her lifetime she gifted most of her personal jewelry to her grandchildren, Princess Elizabeth and Princess Margaret, a clear manifestation of the great love and affection she had for them. 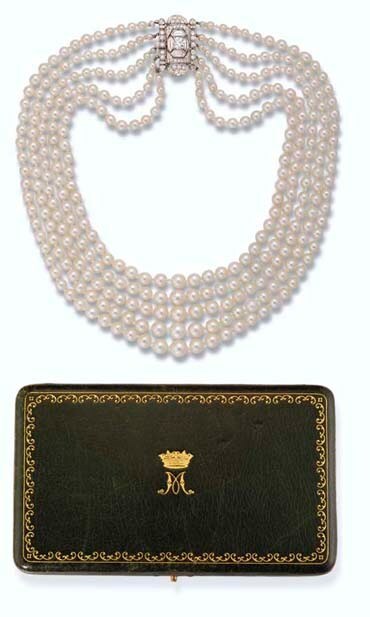 The five-row pearl and diamond necklace was actually given as a birthday gift to Princess Margaret by Queen Mary, in 1948, on the occasion of her 18th birthday. The piece of jewelry subsequently became one of the most cherished pieces owned by Princess Margaret, who wore them on many formal occasions, including her sittings for birthday portraits taken by Baron and Cecil Beaton, for her 19th, 20th and 21st birthdays. Thus, the five-row pearl and diamond necklace became a signature piece, closely identified and associated with the Princess. 1) A translucent mauve enameled silver Faberge clock, embellished with gold decorative elements and diamonds. 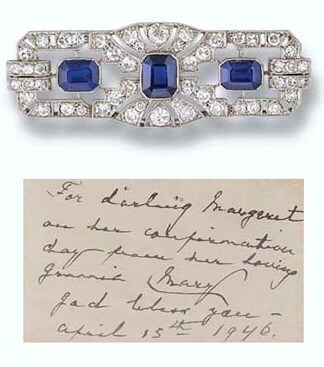 4) An Art Deco sapphire and diamond bar brooch gifted in 1946, accompanied by a handwritten note by Queen Mary, "For darling Margaret on her confirmation day from her loving Grannie Mary R, God Bless You, April 15th 1946"
5) Queen Alexandra’s fan, presented to her by her sister Marie Feodorovna, Empress of Russia, was given to Princess Margaret by Queen Mary in 1952. The painted fan is signed by Ch-Vuillemot and M. Dumas, and dates from the late 19th century. 6) A magnificent and extensive silver-gilt dressing table service in a brass-bound rosewood case, by Paul Storr, London 1837, gifted by Queen Mary circa 1952. The service, that belonged to a member of the royal household, was sold privately to Queen Mary. 7) A French giltwood firescreen stamped with Queen Mary's initial M, and also marked with her private property inventory label. 8) The oak chair, covered with dark-blue velvet, Queen Mary used at the coronation of Princess Margaret's parents, King George VI and Queen Elizabeth Bowes-Lyon, also stamped and marked as above. 9) Queen Mary's Edwardian painted dressing table, also stamped and marked as above. 10) An Irish oak linen chest, presented as a marriage gift in 1891, on the occasion of the wedding of Queen Mary and King George V.
The color and size of the pearls can give an indication as to the possible oyster species in which they originated and the source of the pearls. The silvery-white color of the pearls and their approximate size, 2-8 mm, agrees with the color and size range of pearls, produced by the oyster species, Pinctada radiata, the most prolific pearl producer around which the natural pearl industry of the world was based, since very ancient times, and whose natural habitat was the Persian Gulf, the Red Sea and the Gulf of Mannar. Common colors of pearls produced by these oysters are white and yellow, with overtone colors of silver, cream and pink. Ceylon pearls produced in the Gulf of Mannar, were renowned for their silvery-white colors, but pearls with yellowish and golden hues were also produced (see Ceylon Pearl Necklace). Among pearls produced in the Persian Gulf, yellowish hues were more common, although the desirable silver-white colors were also produced. Thus, the source of the pearls is most probably the Gulf of Mannar, in Sri Lanka or the pearl banks of the Persian Gulf. However, given the period of origin of the pearl necklace, as around 1925, it is highly unlikely that the pearls originated in the Gulf of Mannar, as the pearl fisheries in this region were abandoned in 1906, following the unsuccessful fishery conducted that year under British supervision, in their former colony Ceylon (Sri Lanka). Thus, unless of course the pearl necklace was strung together using pearls previously exported from Sri Lanka, the most probable source of the pearls, is the Persian Gulf, where the natural pearl industry survived until the 1930s and 1940s, until the final death blow to an ancient industry was given, by the popularization of cultured pearls by the Japanese and the imposition of exorbitant taxes by the Indian Government, on the import of pearls from the Persian Gulf. Another oyster species that produces pearls of the same color and range of size, is the Atlantic pearl oyster, Pinctada imbricata, whose natural geographic range is the western Atlantic extending from Bermuda and Florida to Brazil. Pinctada imbricata, previously thought to be an entirely different species, is now believed to be closely related to the Persian Gulf oyster, Pinctada radiata, a sub-species or variety of the same species. From around 1500 to 1650, this species of oyster was intensively exploited by the Spanish colonialists from the lucrative pearl banks off the Cubagua Islands in Venezuela, producing pearls known as Venezuelan pearls. The industry was abandoned around 1650, due to serious decline in production. Thus, it is highly unlikely that the pearls in this necklace are Venezuelan pearls, unless these pearls were derived from an older piece of jewelry containing Venezuelan pearls. Evidence of usage of pearls in ancient times. Pearls were incorporated into necklaces only after ancient man developed the skills of drilling and stringing of pearls. Pearls were one of the first gemstones known to ancient man and together with the more easily obtainable mother-of-pearl shells, were some of the first materials of adornment that were incorporated into items of jewelry by ancient man. One of the earliest evidences of the usage of pearls comes from the Persian Gulf region, where almost 6,000 years ago (4,000 years B.C) people were buried with a pierced pearl in their right hands. Thus ancient middle-eastern civilizations, including the cradle of human civilization, Mesopotamia (3000-2000 B.C. ), appear to be the first to appreciate the beauty and value of pearls and mother-of-pearl shells. Most of these pearls came from the Persian Gulf, the most ancient source of pearls in the world. While sometimes pearls were mounted directly on pieces of jewelry like rings, and pendants without piercing, mostly they were pierced into beads and strung into jewelry items, like necklaces and bracelets, or partially pierced to be suspended as pendants in earrings and necklaces. Thus, the usage of pearls as beads in necklaces appears to have evolved, with ancient man acquiring the technical know how to drill various materials of both organic (bone, coral, horn, ivory, shells, wood, seeds, amber, jet and pearls) and inorganic (gemstones, minerals and metals) origin, and convert them to beads. The oldest piece of pearl jewelry recovered so far is a 3,000-year old three-row pearl necklace, from Susa in Persia. The oldest piece of pearl jewelry on record is the 3,000 year old three-strand pearl necklace, dating back from 9th-7th century B.C. from the period of the Elamite civilization (3200-539 B.C. ), consisting of 216 well-preserved pearls, discovered in Susa, an ancient Persian city, by archaeologist J. Morgan, inside a bronze sarcophagus, belonging to a mummified body. The necklace is now an important display in the Persian Gallery of the Louvre Museum in Paris. Another ancient piece of pearl jewelry, a 2,300 year old, beautiful, Greek pearl necklace, dating back to the 4th century B.C. is on display at the Metropolitan Museum in New York. The usage of pearls reached a climax during this period in Greece, known as the Classical Period, a period of high cultural advancement, from the 6th to 4th century B.C. The Aphrodite Pin in the British Museum, consisting of a larger baroque saltwater pearl and a smaller drop-shaped freshwater pearl, from the sanctuary of Aphrodite in Cyprus, also dates back to the Classical Period of Greece, in the 4th-century B.C. During the period of the ancient Roman empire, extending from 27 B.C. to 476 A.D. pearls became the ultimate symbol of wealth and social standing, that the ownership and wearing of pearls were restricted by law only to the elite in society. In the Roman Empire, pearls were considered to be as valuable as gold, and were used together with gold, to underpin the empire's currency, that Julius Caesar was tempted to invade Britain in 55 B.C. to take control of the freshwater pearl sources of the country. Other ancient civilizations, and periods where pearls were used in jewelry include the Ancient Egyptian (3000-1000 B.C. ), Ancient Iranian - Elamite civilization (3200-539 B.C. ), Ancient Anatolia (2500-700 B.C. ), Indus Valley - Harappa and Mohenjo-daro (2600-1900 B.C. ), Minoan (2700-1400 B.C. ), Mycenaean (1600-1100 B.C. ), Phoenician (1550-300 B.C. ), Ancient Sri Lankan (1000-100 B.C. ), Chinese Han Dynasty (206 B.C.-220 A.D.), Byzantine (476-1204 A.D.), Arabian and Islamic (570-1492 A.D.), European Renaissance (1300-1600 A.D.), Baroque (1590-1730 A.D.), Mogul period in India (1525-1850), Qutb Shahi (1518-1687) and Asaf Jah (1724-1948) kingdoms of Golconda and Hyderabad, Georgian (1714-1830 A.D.), Victorian (1837-1901), Art Nouveau (1890-1915 A.D.), Belle epoque (1901-1920 A.D.), Art Deco (1920-1935 A.D.), Retro (1935-1950 A.D.) and Modern (after 1950). In the New World pearls were first discovered by Columbus in Venezuela in 1498, on his third voyage to the New World, off the coast of the Island of Cubagua, which he later called the "Island of Pearls." His sailors saw women in the Island wearing strings of pearls around their necks, which they subsequently acquired in exchange for items like Malaga dishes, needles, scissors, knives and other utility items. The next discovery of pearls in the New World was made in 1513, also by the Spanish conquistadors, commanded by Vasco Nunez de Balboa, around a group of islands in the Gulf of Panama in the eastern Pacific, which was also named "Islas de las Perlas," the Pearl Islands. The third most significant discovery of pearls was made by Hernan Cortez in 1533, in Mexico when his sailors sailed into "Sea of Cortes" now known as the Gulf of California, and found Peric Indian women wearing necklaces strung with red berries, shells, and black pearls. After this discovery Baja California, became the world's primary source of black pearls, until the discovery of Tahitian pearls in the 19th-century. Thus pearls and mother-of-pearl were used by the ancient civilizations of Mesoamerica for ornamental purposes, and most of these civilizations had developed the art of drilling and stringing pearls, independent of the Old World civilizations. The art of drilling and stringing pearls in the Old World was perfected independently by the different ancient communities living in the coastal regions of the ancient sources of pearls, such as the people of the Mesopotamian and Ancient Iranian civilizations, living around the Persian Gulf and the Red Sea, the people of ancient Indian and Sri Lankan civilizations living closer to the Gulf of Mannar. This art was refined and improved by subsequent generations in these areas, such as the Arabs, Persians, and Indian communities. In Europe too the art of drilling and stringing pearls were perfected particularly during the Renaissance period in the 16th and 17th centuries, when large quantities of undrilled pearls from the New World, reached the capital cities of the different monarchies, through Seville in Spain and Lisbon in Madrid. Old World pearls from the newly colonized nations in the Persian Gulf region and Asia, also began to reach Europe in large quantities, after the early 16th-century. The drilled pearls were strung into strands and necklaces, as the seven-strand long pearl necklace worn by Queen Elizabeth I (1533-1603), in her famous Armada portrait. The art of drilling seed pearls was also perfected, which was used for embroidering the robes of the royalty. Queen Elizabeth I, wears such a pearl embroidered dress in the Armada portrait, and was believed to have owned over 3,000 such pearl embroidered dresses. The portrait of Mary, Queen of Scots (1542-1587) also show her wearing a seed pearl embroidered dress. The art of drilling and stringing pearls perfected in the Qutb Shahi and Asaf Jah kingdoms of Golconda and Hyderabad from the early 16-th to 20-th centuries. The art of drilling and stringing pearls developed during the Qutb Shahi kingdom of Golconda from 1518 to 1687, was further refined and perfected during the 224-year rule of the Nizams of Hyderabad of the Asaf Jah dynasty. The Nizams of Hyderabad extended their patronage to the jewelry industry based on pearls, and paid attractive prices for pearls imported from the Persian Gulf region. This encouraged the Arab traders of the Persian Gulf to sell their pearls to the Nizams of Hyderabad, and Arab artisans who were skilled in sorting, grading and piercing pearls to settle down in Hyderabad, and work for the Nizams. The skills of drilling pearls was a jealously guarded secret passed down from generation to generation. Drilling is a highly skilled job, still done manually, and carried out to perfection in Hyderabad, without damaging the pearls. It is the availability of this skilled manpower in Hyderabad, that has turned it into the world's leading center of pearl jewelry manufacture and trade today. It is said that 9 out of 10 pearls in the world today, pass through Hyderabad in India, at a certain stage for finishing, such as piercing and stringing. In the olden days the main supplier of pearls for the Hyderabad pearl industry was Ceylon (Sri Lanka) and the countries of the Persian Gulf. In the modern period the main supplier of pearls are China and Japan, the leading producers of cultured pearls in the world today. In Hyderabad today traditional jewelry designs survive side by side with modern western designs. The traditional pearl jewelry designs still produced are the "Satlada and Panchlada Haar" the seven and five-stranded pearl necklaces, interspersed with emerald or onyx beads, set in 9-carat gold. Other items include the "Karanphool and "Cholaphool" set with uncut diamonds and pearls, the "Gulubund" choker made up of five strings of pearls, interspersed with three gold pendants set with rubies and emeralds, and the "Nagaram" an elaborate pendant made of kundan work. What prompted Pincess Margaret's children Viscount Linley and Lady Sarah Chatto to sell their mother's collection of jewelry? Princess Margaret's invaluable collection of jewelry, Faberge, furniture and works of art, a historically significant collection, that reflected the life and tastes of a remarkable princess, the sister of a reigning monarch, and one of the Royal Family's most glamorous personalities, consisting of over 800 items, each having a story behind it, was put up for sale at a Christie's auction in London, on June 13, 2006, by the princess' two children, Viscount Linley and Lady Sarah, who inherited the collection from their mother. Due to the historical significance of some of the pieces in the collection, particularly those gifted by Queen Mary, her grandmother and King Geroge VI and Queen Elizabeth Bowes-Lyon, her parents, the sale of the items caused a lot of displeasure among the Royal Family, including the Princess' elder sister, Her Majesty Queen Elizabeth II. Among the items were several gifts from royal duties, and Queen Elizabeth is believed to have insisted, that money raised from such royal duty gifts, should go to charity. Princess Margaret's former husband, Lord Snowdon, also expressed his unhappiness about the sale of the historic items, and questioned the right of his children to sell some of the items, considered to be family heirlooms. Yet, Viscount Linley and Lady Sarah Chatoo, had their way, and all items listed for the sale were put up for auction, and none of them were withdrawn from the sale. In fact the decision to sell the invaluable collection, was a difficult one for Princess Margaret's children, who were reluctantly compelled to arrive at this difficult decision, because of the heavy death duties, imposed on the Princess' multimillion-pound estate. Christie's had made a conservative estimate of £2 million (US $3.6 million) as proceeds from the sale, which the children hoped to use in the settlement of outstanding inheritance taxes estimated to be around £3 million. However, part of the proceeds was also expected to go to charitable causes, including the Princess Margaret's fund at the Stroke Association, founded by her son Viscount Linley. However, skeptics believed, the sale was actually part of a general financial shake-up for the successful furniture designer, Viscount Linley, who together with his wife, Serena, had a reputation for shrewd buying and selling of property, and had put up their Chelsea flat, which they purchased for around Â£1 million, for sale, with an asking price of £1.5 million. According to the "Hello" Magazine of April 11, 2006, seven years ago Princess Margaret transferred the ownership of her beloved holiday home on the Island of Mustique, to her son, the only property she owned, in order to avoid inheritance tax. However, soon after receiving the house Viscount Linley is reported to have sold it off for an estimated £2.4 million, a transaction that is said to have broken the Princess' heart. Another reason that might have prompted Viscount Linley and his sister Lady Sarah Chatoo to sell the historic collection, was that neither of them presently lead royal lives in the style of certain other members of the family, and hence were unlikely to put most of the items to any use. Thus, the decision to sell was described as one that favored practicality over sentimentality. The auction was held on two successive days, 13th and 14th June, 2006, and netted a record Â£13.6 million, over Â£10 million more than the pre-sale total estimate of Â£2 million. The sale that took place at Christie's London, King Street auction venue, was held in two parts on the 13th and 14th of June, 2006. Out of the 800 items in the collection, day one was allocated for the sale of around 200 items only - about a quarter of the collection - that included only Jewelry and Faberge from the collection. The remaining 600 items, that included furniture, silver, works of art and decorative objects, was sold on the second day of the auction. As stated earlier, Christie's had made a conservative estimate of only £2 million for the entire collection. However, Christie's auction officials were astounded when on the first day itself, the jewelry items and Faberge put out on auction, netted almost £10 million (Â£9,597,680), beyond all expectations, and some items fetching 100 times, their estimated value. After the end of the first day's sale, auction officials revised their previous total estimate to £30 million. However, on the second day of the auction, there was less demand for items like decorative objects, and the amount netted was just over £3.6 million, giving total proceeds of £13, 600,000 equivalent to US $25,104,742. Highlights of the collection were exhibited around the world by Christie's before the auctions. In London visitors were given the rare opportunity to try on some of the pieces of royal jewelry. Prior to the auctions Christie's had exhibited important pieces from the collection, at its offices around the world. In London, some of the highlights from the Princess' jewelry collection were exhibited over two days, on May 8th and 9th, 2006 in the Double Cube Room at Wilton House near Salisbury, and as reported by the BBC, visitors to the Cube Room were not only given the chance to feast their eyes on some exquisite pieces of royal jewelry, but also to try them on as well ! A rare opportunity for a commoner to wear at least for a fleeting moment, jewelry used by the royalty, including a royal tiara !! The historic auction generated unprecedented interest, and around a 1,000 bidders from all over the world, both jewelry collectors and royal fans, packed the four video-linked auction rooms of Christie's auction house, and were joined in the bidding process by over 2,500 clients, who either left written bids, or bid in person, by telephone and online. Several ranks of staff from Christie's were at hand to take telephone and online bids, from the nearly 2,500 prospective customers. There were few familiar faces among the bidders. It was believed that most of the rich and famous sent proxies to bid on their behalf, or preferred to do business in privacy by phone. As usual many speculators were among the bidders, trying to secure anything that interested them, a safe investment for the future, that could bring windfall profits. The auction kicked off on schedule, with Christie's auctioneer Francois Curiel, starting the bidding for Lot No.1 - a ruby, cultured pearl and diamond necklace, with a pre-sale estimate of £1,200 to £1,500 - at a modest £500. What transpired immediately after this was unbelievable, with the bid sky-rocketing to £6,000 within just 30 seconds and reaching £27,600, 18 times more than the upper pre-sale estimate, when the hammer was brought down in favor of an anonymous buyer, setting the tone for all the items that followed. What followed, as Paul Harris of the Daily Mail put it, was a price stampede to secure a slice of Princess Margaret's life. However, a clear indication of how much the public cherished Princess Margaret's memory, came only when some of the more modest items in the collection, came up for sale. A cultured pearl jabot pin, designed as a butterfly, valued at less than £60, went for £6,000, 100 times more than the pre-sale estimate. Likewise, two small ivory bracelets, not much different from those, one might buy for a child in a holiday souvenir shop, with a pre-sale estimate of £200 to £300, sold for £3,360, eleven times more than the upper estimate. A ladies watch by Mathey-Tissot, valued at £50 to £100, sold for £4,800, 48 times more than the upper estimate. Another Cartier ladies wrist watch purchased for £100 by the Queen mother as a Christmas present for her daughter, when she was 20, with a pre-sale estimate of £2,000 to £3,000, sold for a staggering £57,600, 19 times higher than the upper estimate. The item that became the top selling lot on the first day of the auction, was a translucent mauve enameled silver, Faberge clock, with gold decorative elements - item no. 1 in the list of items given above, gifted by Queen Mary - with a pre-sale estimate of £600,000 to £800,000, that realized a record price of £1,240,000 (US $2,281,600), almost 1½ times the upper estimate, the second highest price ever paid for any Faberge clock. The vintage clock of Russian origin, was sought after by many international bidders, including several Russian clients. The clock eventually sold to an anonymous bidder who bid by telephone. In all there were 13 pieces by Faberge which fetched a total price of £2,735,600 equivalent to US$ 5,033,504. Another gift by Queen Mary, an antique diamond riviare, worn by her at her son King George VI's coronation, consisting of 34 diamonds, weighing 85 carats, accompanied by three handwritten notes, naming the necklace as the "Lady Mount Stephen, after its previous owner, with a pre-sale estimate of £200,000 to £300,000 (US $368,000 to $552,000), was sold for £993,600 (US $1,828,224), three-and-half times higher than the upper estimate. 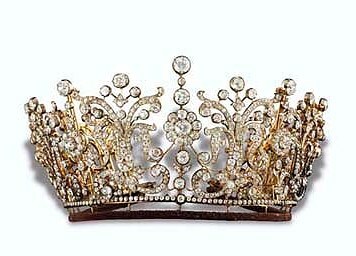 The Poltimore Tiara, designed and created in 1870, by Garrards, the royal jewelers, for Lady Florence Poltimore, the wife of the second Baron Poltimore, was acquired on the advice of the Deputy Master of the Household, Patrick Plunkett, in anticipation of Princess Margaret's marriage to Mr. Antony Armstrong Jones. The Princess wore the tiara in its alternative form, dismantled into a stunning diamond fringe necklace and scroll brooches, on several occasions before her wedding. On the wedding day, May 6, 1960, the Princess arrived at the Westminster Abbey, by horse carriage, wearing the Poltimore Tiara, that also served to hold her veil in place. Competition was severe among the bidders for this historic tiara, with a pre-sale estimate of £150,000 to £200,000, which eventually sold for £926,400 (US $1,704,576) four-and-half times higher than the upper estimate. An antique Victorian diamond and gem-set bee bar brooch, accompanied by a note in Princess Margaret's own hand, "Almost the first bit of jewelry given to Mum...given to me 10 Feb 1945." The brooch was initially a christening gift to Lady Elizabeth Bowes-Lyon, which she later gave to her daughter in 1945. A pre-sale estimate of £500 to £700 was placed on the brooch sold for £33,600 (US $61,824), 48 times higher than the upper estimate. 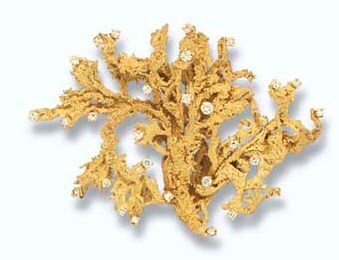 A diamond-set Lichen brooch, cast in yellow gold in 1967, by Andrew Grima from a piece of lichen sent to him by the princess, as a prototype, an interesting example of her personal involvement in the design of some pieces of jewelry, reflecting her inclination towards the appreciation and patronage of the arts. A pre-sale estimate of £700 to £900 was placed on this brooch, which sold at an enhanced price of £12,000 (US $22,080), 13 times higher than the upper estimate. 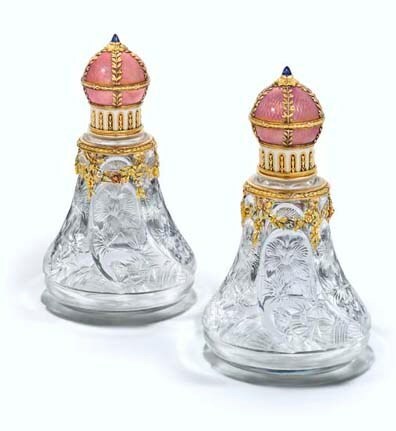 A pair of Russian jeweled guilloche enameled vari-color gold-mounted cut glass scent bottles, by Karl Faberge produced between 1896-1908, with a pre-sale estimate of £40,000 to £60,000, sold for £366,400, six times higher than the upper estimate. An Art Deco sapphire and diamond brooch, circa 1925, accompanied by a note in the hand of Queen Mary, "For darling Margaret on her confirmation day from her loving Grannie Mary R God bless you April 15th 1946." A pre-sale estimate of £1,500 to £2,000 was placed on the brooch, which was sold for £66,000, 33 times higher than the upper estimate. The Five-Row Art Deco Pearl and Diamond Necklace, the subject of this webpage, and a gift by her grandmother Queen Mary on her 18th birthday, and came to be closely associated with the image of the Princess, was Lot No. 118, and featured prominently on the first day of the auctions. A pre-sale estimate of £15,000 to £20,000 (US $27,600-$36,800) was placed on the historic necklace. After a keenly contested bid, the hammer was finally brought down in favor of an anonymous buyer, for £276,800 (US $509,312) almost 14 times more than the upper estimate. Francois Curiel, chairman of Christie's Europe, who was also the auctioneer of the sale, in attempting to provide an explanation for the unprecedented worldwide interest generated by the sale, and the record-breaking prices achieved by the lots, far exceeding all pre-sale estimates, commented, "The extraordinary results of this important and unparalleled sale are a wonderful tribute to a beautiful and stylish princess. HRH The Princess Margaret's wide-spread appeal was reflected in the exceptional prices achieved throughout the sale, as buyers from all over the world bid fiercely, sending prices soaring above their presale estimates,"
This is clearly a rare example of an auction, where provenance had a significantly greater value that the actual material value of the lots put out on sale. The wide-spread popularity of the princess, was undoubtedly a key factor, that enhanced the prices of the pieces, as claimed by Francois Curiel, with bidders vying with each other, to own something used and cherished by a Princess, whom they loved, adored and respected. A factor that was appropriately labeled the "princess' premium" by observers of the auction. Helen Molesworth, a jewelry specialist at Christie's, described the historic events as a "sale of a lifetime". She said: "We are over the moon and delighted to have achieved such a fantastic result – and even more delighted to have received such a warm reception. This is a one-off for my career, this is a sale of a lifetime. For me this is the epitome of the personal side of the Royal Family. We have the combination of Royal provenance and glamour which have a wonderful appeal to the British public." Another spokesman for the auction house said, "We are extremely pleased with the result of this sale. Many of the lots far exceeded expectations. This goes to show the continuing and enduring appeal for the royal family." Several of the pieces on sale had both a royal and historical provenance associated with it, such as the items gifted by Queen Mary, including the Five-Row Art Deco Pearl and Diamond Necklace, the subject of this webpage. Other items included gifts from her father King Geroge VI and her mother Queen Elizabeth Bowes-Lyon. Some of the pieces dated back to the period of King George III, such as the George III Sapphire and Diamond ring, circa 1800, and George III Diamond Maltese Cross, circa 1810. Several of the items were steeped in Russian history, such as the 13 Faberge pieces, that attracted Russian bidders, and fetched very high prices, including the top-selling lot, a Russian jeweled two-color gold-mounted guilloche enameled silver clock.